03-Aug-2008 -- Our visit to confluence point 1S 10E had been decided as a one-day expedition from Libreville and back: first leg by 4x4 to Lambaréné and second leg hiring a pirogue to Lake Onangué. Driving the 237 km of the main road from Libreville to Lambaréné in only 3 hours is not an easy job, even if "Grumier" trucks are forbidden on the road on weekends. But this main road is sometimes as good as European roads in the years 1970, and sometimes full of horrible unadvertised deep holes, and real walls in the tar between "new" and "old" parts of the road. Having left Libreville at 7:10, we were anyway in Lambaréné, Ogooué Palace Hotel, at 10:10 for pirogue negotiation. The pirogue manager considered our target point was "reachable" and after half an hour waiting for him to find a pirogue, and a "piroguier", we spent another half an hour negotiating the price, and the deal was done. We left the "hotel pier" at 11:15, but... without enough petrol, and thus had to start by a stop at the petrol station, which is at the same time the fish market. There was surely petrol there, but no oil, which meant so extra time for another pirogue searching oil for us. We finally left the petrol station pier at 11:40. 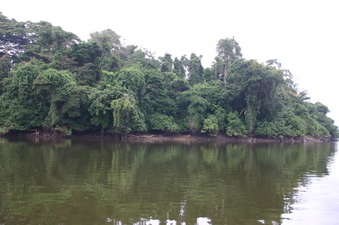 We went downstream on the main Ogooué stream on a 47 km/h steady speed run until Ompomouena, and there turned left towards a small arm of the river, circling south of Evaro lake, and we emerged on Onangué lake in its middle at 12:35. A sudden stop of ten minutes was necessary as we went out of petrol, but the extra tank was there, and the navigation resumed. We finally arrived on the spot at 13:00, having crossed the lake east to west and circled around some islands. The confluence point is in the water, less than one hundred meters from the lakeshore, in a quite nice place. After taking the necessary pictures, we landed on a small beach beside for picnic, and champagne! For the trip back, we left the beach at 13:50 and went back through the northern part of Onangué lake, through a small canal to the Ogooué, and then upstream at 41 km/h to Lambaréné where we arrived at 15:20. We met some other pirogues and boats on the Ogooué, but at the remote part of this 120 km roundabout pirogue trip, we were really the only ones in the area, which seems to be visited only by some fishermen living in small villages around the lake. We then had a visit to Lambaréné historical hospital and were back in Libreville after a quite exhausting run ending in the night at Libreville. As one can see on the record of the pirogue track, the Google earth map doesn't perfectly fit with the GPS records, and should be readjusted some 250 meters southwest. In the waters of the large Lake Onangué.